Here’s something that finally dawned on me. Family Fun is usually NOT easy, and sometimes it’s not even fun. Actually, sometimes it’s a downright pain in the @$&. The reason family fun is such a pain is that you actually have to plan something and planning takes time . . . time that we don’t usually have. “Fun” also usually means trying something new and that means that we don’t really know how to do it well the first time, and it was such a bad experience that we don’t try it ever again. Well, here’s what I’ve also realized, family fun IS memorable. Memorable for you, your kids, your spouse, your friends, your extended family. Good, bad or ugly, it’s memorable. And THAT is why I keep doing it. No matter what, we have a story to tell; and today’s “fun” falls in the @$& ugly category. 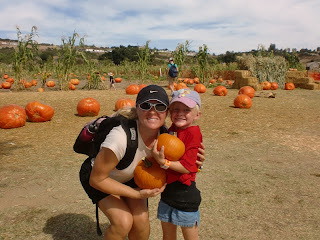 Today I attended a pumpkin patch field trip with the Id (the baby). While we were on this field trip the woman at the pumpkin patch held up the pumpkins you can use to make pumpkin pie, and that’s when I had a stroke of genius. I’ll make a fresh pumpkin pie . . . from actual pumpkins. 1) When driving to the pumpkin patch to meet your child's class, do not bring your small convertible; you MAY end up with 40 pounds of pumpkins in your trunk and then unable to put the top down. 2) DO NOT attend the educational information sessions that they have at the pumpkin patch. All the hay that gets in your sinuses will make you groggy and you will end up thinking that you can be Martha Stewart and make a pumpkin pie from scratch. 3) While you are making this ridiculous fresh pumpkin pie, you will have an epiphany – Martha Stewart for dummies (and you are the dummy). In Martha’s magazine, all the recipes and projects have 15 ingredients and 35 steps; and lets not mention the special pans you have to use. My adventure up to my elbows in fresh pumpkin goo pointed out to me that I CAN be Martha even if I have 3 children, a part time job and any number of other things I am doing. I just have to know which short cuts to take. Here’s the only problem. The pie baked fine and had a good consistency, but it tasted like @$&. I don’t know what those reviewers at allrecipes.com were thinking when they reviewed this recipe and said it was good, but in the words of my husband . . . “did you skip the sugar step”?! Tomorrow I will post the recipes that I used and I’ll also post the “read between the lines” instructions. These are the instructions that only a Martha would know and the rest of us Dummies have to figure out the hard way. Here’s my challenge to all you out there . . . help me with my first Martha Stewart for Dummies– how to make a fresh pumpkin pie in an hour and ½ or less and not have it turn out tasting like @$&. You can share with me your recommendations and ideas and I'll try them. And extra credit for those who make a fresh gluten free crust recommendation. And for all you smart @$&es out there, recommending that I use canned pumpkin misses the point!